"Super-glued. Do not pull me!" read the note stuck to a train window at the Docklands Light Railway station in London next to an activist who attached himself to the carriage, as serious disruption is brought to the capital due to climate demonstrations. Two activists of the Extinction Rebellion protest — aimed to highlight the issue of climate change — stood on the top of a train at the station, holding a banner which read "Climate Emergency. Act Now." The Metropolitan Police reported that the threshold of serious disruption has been met and imposed a condition on protesters that their activity should be limited to Marble Arch area only. At least 168 arrests have been made on 16 April by the police, bringing the total number of arrests of the two days of protests in London to 290, according to police figures issued on Wednesday. The British Transport Police decided to restrict access to WiFi at underground stations "in the interests of safety and to prevent and deter serious disruption to the London Underground network. Passengers can expect to see higher than usual numbers of BTP officers on duty, said the service. "We have robust plans in place to help us respond to any potential protest activity targeting London's rail network including the London Underground. Over the next few days a large number of additional officers will be on patrol to help facilitate what we hope is a safe and peaceful protest. However, we will not tolerate any activity which disrupts the millions of passengers who rely on using the rail network in London. During the next 24 hours, these intelligence-led patrols will be in place to help keep everyone safe and to ensure that disruption is kept to a minimum," Superintendent Matt Allingham from British Transport Police, said. Travelling into #London today? We're anticipating disruption to Tube services as a result of #ExtinctionRebellion protest activity. 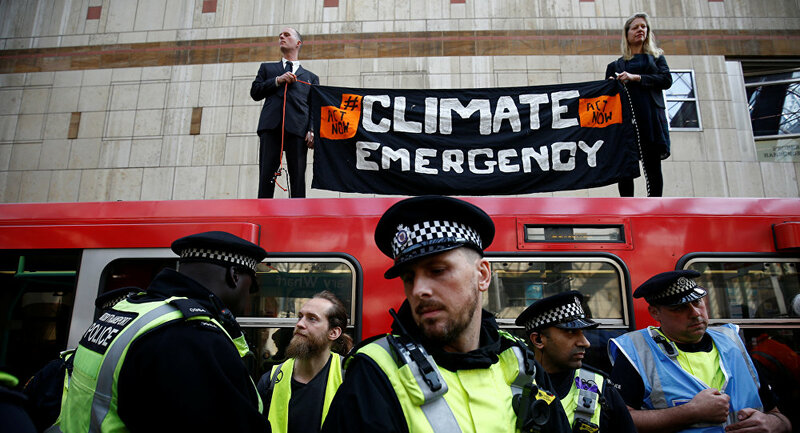 The Extinction Rebellion protesters demand the authorities declare a climate and ecological emergency, reduce greenhouse gas emissions to net zero by 2025 and create a citizen's assembly of members of the public to lead on decisions to address climate change.